Canadian farmers reported increased production of canola, soybean, oats and corn for grain in 2017, while wheat and barley production was lower than in 2016. Despite producers' concerns of drought on the Prairies and heavier than average precipitation in parts of Eastern Canada this summer, farmers reported that yields have improved from their preliminary expectations reported in the July 2017 Farm Survey. Total wheat production declined 5.5% to 30.0 million tonnes in 2017. Harvested area edged up from 2016 to 22.2 million acres, while average total wheat yield declined 3.6 bushels per acre to 49.6 bushels per acre. In Alberta, wheat production edged up 0.8% to 10.0 million tonnes in 2017. This was the result of a 10.7% rise in harvested area to 7.0 million acres, while the average yield fell by 5.4 bushels per acre to 52.6 bushels per acre. In contrast, farmers in Saskatchewan reported an 11.3% decline in production to 12.9 million tonnes. The drop was the result of a 10.8% decrease in average yield to 42.2 bushels per acre. Harvested area edged down 0.8% to 11.2 million acres in 2017. Manitoba farmers reported that wheat production rose 3.6% to 4.4 million tonnes in 2017. Although harvested area declined 8.2% to 2.7 million acres, a 12.6% rise in average yield to 59.8 bushels per acre drove the production increase. In Ontario, overall wheat production was reported at 2.3 million tonnes, mainly the result of winter wheat, which saw a 5.6% decrease in harvested area from 2016, as well as a 4.6% decline in average yield to 83.7 bushels per acre in 2017. Despite this decline, it was the second highest winter wheat yield on record, following the 90.9 bushels per acre posted in 2016. Canadian farmers reported producing 21.3 million tonnes of canola in 2017, up 8.7% from 19.6 million tonnes in 2016. This was the result of a record high harvested area of 22.9 million acres, up 14.1% from 2016. However, farmers reported a 4.9% decrease in average yield to 41.0 bushels per acre, down from the record high set in 2016. Saskatchewan farmers reported a 4.7% increase in canola production from 2016 to a record high 11.2 million tonnes in 2017, the result of a record harvested area of 12.7 million acres (+14.2%). However, average yield fell 8.3% to 38.9 bushels per acre. In Alberta, farmers reported a 10.9% increase in canola production from 2016 to 6.8 million tonnes. This was the result of a 17.8% rise in harvested acreage, as average yield fell 5.8% to 43.7 bushels per acre in 2017. Manitoba farmers reported that canola production rose 20.7% to a record high 3.1 million tonnes. This was the result of a record average yield of 44.0 bushels per acre, up 12.8% from 2016, combined with a 6.9% increase in harvested area. 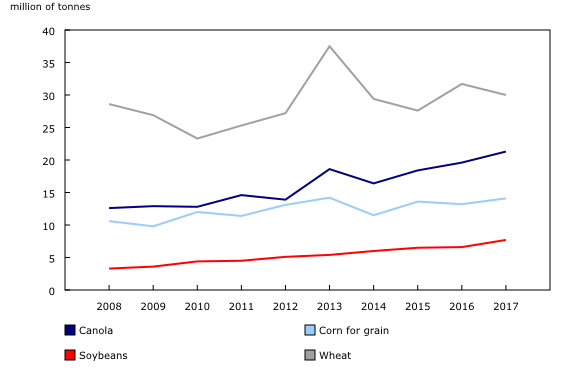 Corn for grain production in Canada rose 6.8% from 2016 to 14.1 million tonnes—the second highest corn for grain production on record, following the 14.2 million tonnes posted during the bumper crop of 2013. Ontario farmers reported an 8.5% increase in corn for grain production to 8.7 million tonnes in 2017. This was the result of increases in both harvested area (+3.0% to 2.1 million acres) and average yield (+5.4% to 167.0 bushels per acre). Quebec farmers reported that corn for grain production was relatively stable at 3.8 million tonnes, down 10 000 tonnes from 2016. A 5.3% increase in harvested area was offset by a 5.3% decline in average yield. Conversely, Manitoba farmers reported an 8.7% rise in corn for grain production to a record 1.3 million tonnes. This was mainly the result of an 18.2% increase in harvested area to a record 390,000 acres, as average yield fell 8.0% to 128.2 bushels per acre. Nationally, soybean production reached a record high once again in 2017, up 17.8% from 2016 to 7.7 million tonnes. Average yield fell 11.5% to 39.1 bushels per acre, while harvested area reached a record high 7.3 million acres. In Manitoba, farmers reported record soybean production for the sixth consecutive year, up 26.9% from 2016 to 2.2 million tonnes in 2017. This was entirely the result of a 45.1% increase in harvested area to a record 2.3 million acres, while the average yield fell 12.6% from 2016 to 36.1 bushels per acre. Ontario soybean growers reported a 12.5% production increase to a record high 3.8 million tonnes in 2017. Harvested area rose 13.3% to match the 2014 record high of 3.1 million acres, while average yield decreased 0.7% to 45.6 bushels per acre. In Saskatchewan, where soybean harvested area more than tripled to 845,000 acres in 2017, farmers reported soybean production of 479 000 tonnes, up 276 500 tonnes from 2016. Meanwhile, Quebec producers reported a 1.3% production decrease to 1.1 million tonnes. Canadian farmers reported a 10.2% decrease in barley production to 7.9 million tonnes in 2017. This decline was the result of a 4.9% decrease in harvested area to 5.2 million acres, combined with a 5.4% drop in average yield to 69.4 bushels per acre. Meanwhile, Canadian farmers reported oats production rose 16.6% from 2016 to 3.7 million tonnes. The increase was attributable to a record high yield of 93.1 bushels per acre, combined with a 15.7% increase in harvested area to 2.6 million acres. The November Farm Survey of crop production covering approximately 26,800 Canadian farms was conducted from October 20 to November 13, 2017. Farmers were asked to report their estimated seeded and harvested areas, yield and production of grains, oilseeds and special crops. This survey collected data from every province. This release provides the final production estimates for 2017, which are subject to revision for two years. Percentage changes are calculated using unrounded data. As of December 6, 2017, data from CANSIM table 001-0010 (field crops data expressed in metric units of measure) has been transferred over to CANSIM table 001-0017. Therefore, all of the crops data on areas, yields and production, whether expressed in imperial or metric units of measure, is available under CANSIM table 001-0017 only. Table 001-0010 has been deleted as a result of this merge process. Auxiliary data source: Readers are invited to visit the Crop Condition Assessment Program web application, which is an additional tool to assess growing conditions of field crops during the crop year. Readers can monitor a vegetation index of crop land on a weekly basis.